This past week I happened upon a congregation of geese rarely seen in western MT. Over 500 of the giant honkers were working some fields just west of Missoula. On Friday, I watched waves and waves of birds land in a field like they were college kids heading in for a Chinese all you can eat buffet. I stopped in at the adjacent residence to inquire about access. The woman who answered the door was pleasant as could be but informed me that they only leased the land and that I would have to contact the owners…and she said it was highly unlikely that we would get permission. I made some calls and at this posting…no confirmation yet, up or down. On Saturday I returned to see what the geese were up to. They were now landing in a different field across the road. Again, the Canadians were landing in droves with no care in the world. I inquired at the nearby farmhouse, but they gave me a similar story as before. They were kind enough to pass along the name of the landowner whose field was being assaulted by the geese. Quite easily I was able to raise the landowner but to no avail. I wasn’t the first to ask but the answer was the same to all, no. I was polite and understand that it was his prerogative. At this point my shirt was soaked from salivating over this migratory opportunity. I ended up getting access to a field within 300 yards of where the honey hole was…now it was time to plan our trickery. It was time for the Sunday sermon! I called up my friend who has fowl fever just as bad as me. Our meeting time in the morning was discussed feverishly, with the final time of 6:15am being decided on, which of course my partner broke. I pulled my gear together that night, checked it twice, and set out the fixins for hot cocoa. 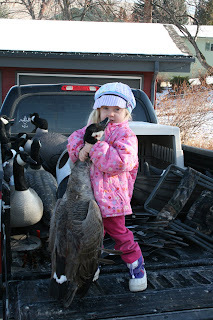 The next morning, I gathered my decoys, warm clothes, and cocoa as quietly as possible not to wake the two young kids and feel the much understood heat from my wife. My fellow fowler was late, so I drug out all my decoys and waited for him to arrive. After he arrived and after much discussion, we decided on the traditional “V”. Super Magnum shells on the front edge to attract attention, silhouettes to fill in the middle and our legion of full body flocked heads for the finishers. It took some time but we were set up before first light. And then we waited, and waited some more…it wasn’t a question of if the geese were coming but when. In an instant the familiar honk was heard. A sentry had been sent to check out the lay of the land. We gave the appropriate honks in return and the massive bird finished beautifully into the decoys, he didn’t leave. My partner and I looked at each other thinking instantly the same thing….if this was any indication on how they day was going to go; we were in for a barn burner. For the next hour and a half, wave after wave of honkers would appear groups of twenty, fifteen, and fifty! But alas, they were fixed on the adjacent field. They came on a line from the river and descended into the field with one fail sweep. Each time we saw a squadron we would hit the flag trying to grab their attention, followed by honks after honks after honks. Goose flutes have never been played with such vigor, but to no avail. I’m still feeling the pains of frustration. Sometimes even the best laid plans don’t bear fruit…though I’m still holding out hope for a game changing phone call.